Kraus khu100-30 is a heavy duty sink that is perfect for your kitchen. It fixes very well in your kitchen and provides hardworking. 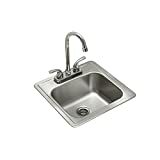 It is a single bowl kitchen sink of 30 inches what is large enough to provide you flexibility. It will provide you the greater strength and durability with its 16-gauge T-304 stainless steel. 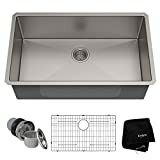 for the construction of this 30- inch sink, it has reached in higher quality. 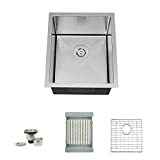 The design and the material made the 16 gauge stainless steel sink capable of managing the toughest messes, and in the same way, it will look new always for its stainless finish. Kraus stainless steel sink is perfect to flexible for its larger size and depth. It is an enough deep sink that will allow you to clean the largest kitchenware such as baking sheets, skillets, and stockpots. You can keep up to 30 dinner plates in 30 inch kitchen sink. And it is a thicker steel sink and stronger that will resist dent in your sink for using it roughly also. Kraus kitchen sinks don’t stop with the feature of durability and flexible size, that have another wonderful feature which must satisfy you. And that is soundproof technology. It is really bothering when your sink makes a lot of sound during washing activities. This 30 inch sink has come with the solution to this problem which creates the lowest sound. 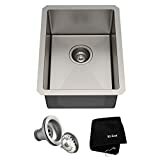 It has extra thick rubber sound dampening pads which are covered almost over the sink base and reduces vibration and noise when you will use it. Thus, it will provide you more comfortable noise free cleaning environment. One of the most important matters about the sinks is well drainage system. If the water doesn’t drain perfectly, then your basin will turn into a pool which will stop your continuous cleaning activities. Kraus sinks have engineered well with channel grooves for optimal drainage which prevents water pooling in the sinks. 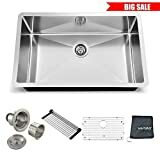 Besides, you will get some extra accessories with these sinks such as stainless-steel dish grid which is multifunctional and also can protect the sink bottom, three pieces of basket strainer set and kitchen towel. Thus, Kraus kitchen sinks can complete a full professional washing activity. Question : The mentioned size what it offers, is it fit for anyone? 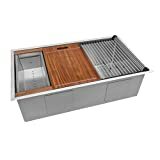 Kraus khu100-30 is a perfect and fashionable sink for your busy kitchen. 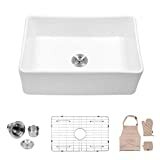 It is a durable and well-designed sink that we have found it as a high-quality sink. 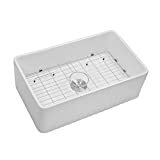 It will allow you to wash the largest kitchenware very flexible for its large rectangular size besides the size it is deep also and it has well drainage system which will more wash continuously without water pooling. The stainless-steel sink will provide you long life service which resists corrosion, dust, and dent. It has soundproof technology which will reduce vibration and sound that make you comfortable. The extra accessories that will provide you multifunctional uses and it has lifetime warranty offer. Kraus khu100-30 kitchen sinks are multifunctional in the same way fashionable also.